Bournemouth 4-0 Chelsea: Now Maurizio Sarri has to go so Chelsea can save their season. Chelsea suffered a humiliating 4-0 defeat tonight to Bournemouth at the Vitality Stadium and full credit to our hosts for their performance. 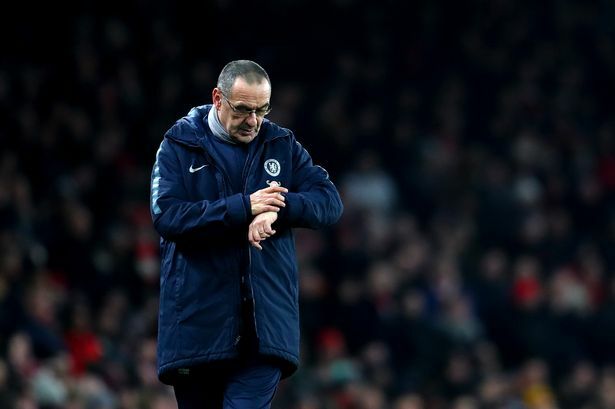 As for Maurizio Sarri - I have nothing against the man personally but seriously, now he has to go in order to save our season and cling onto a top four position. Tonight was another demonstration of how Sarri-Ball does not work in the Premier League. You can pass, pass and bloody pass the ball as much as you like, if you create little or hardly anything from it then what's the point? It does not work! Gonzalo Higuain has come into the club as the saviour of Sarri-Ball, someone who knows how Sarri wants to play and will score the goals to save us. The problem is for two games running, he has hardly had a chance, a sniff of a goal and was replaced with around twenty-five minutes to go as he was hardly in the game. Chelsea lack real dynamism, we lack pace and potency in attack and everything is one-paced making it easier for the teams we place against to defend. Look at Bournemouth tonight, they dug in and were organised defensively when they needed to be. They knew that we would dominate the ball but were more than happy to sit in their shape waiting for us to try and break them down. When they had an opportunity in that first-half they broke on us, we couldn't cope with gaps through the framework of our formation all over the place forcing Kepa into a number of saves to keep us in it. If you then add lazy, sloppy defending to the equation, then we all know we are asking for trouble and we got exactly that this evening. How many more times do we need to say this? How many more poor, slow and boring performances is it going to take until the club decides to act? Remember, Maurizio Sarri came here with a reputation for playing good expansive football - IN SERIE A. He won NOTHING, no trophies on his CV but we bought into a philosophy having got rid of a serial winner. Our club is about the short-term and results now. Anyone that believes otherwise is deluded! What happens if we decide to stick with Sarri and look to build with players he wants over the next two or three transfer windows - but finish outside the top four and win no trophies? Is that acceptable? The biggest red flag for me and I have to be sure that the Chelsea board would have stopped in their tracks when they heard it, was when Sarri complained to the press/media that it was difficult to motivate his players! A manager comes into a club to coach the players, to train them into his way, to motivate them to play his way. He picks the players, he decides what substitutions to make - it's his role! Yes the players have a responsibility to do the job they are paid to do and they MUST accept their part in all this but, and I keep saying this, Maurizio Sarri is there to manage, to motivate, to select the best team with the best players in their best positions to get the best out of our season. He refuses to rotate players, he continues to play Jorginho in a role that requires a level of ability to defend in front of our back-four which he can't do. He continues to hamper the effect on a football-match that N'Golo Kante has in-game and it's obvious that Eden Hazard has an eye on Madrid now having been forced to play in a role he doesn't like doing. We are in real danger of our season falling apart here. We need the manager to change the formation, to change players to their best positions but he refuses. It's time for Maurizio Sarri to go.